This report was released by the Multi-State Shale Research Collaborative, a joint effort of the Pennsylvania Budget Policy Center, Keystone Research Center, Fiscal Policy Institute in New York, Policy Matters Ohio, West Virginia Center on Budget & Policy, and The Commonwealth Institute in Virginia. Over the last five years, firms with an economic interest in the expansion of drilling in the Marcellus and Utica shale formations — and their allies, supporters, and trade associations — have used a variety of tools and techniques to exaggerate the employment impacts of shale drilling. These strategies have ranged from the use of inappropriate measures, such as data on new hires, to represent job growth to the misleading attribution of all jobs in “ancillary” industries to the shale industry. An explicit example of this “defense by exaggeration” strategy occurred on July 19, 2012, at a Harrisburg press conference during which the Pennsylvania Chamber of Business and Industry joined the U.S. Chamber of Commerce for the launch of its “Shale Works for US” campaign. At this event, Karen Harbert, the president and CEO of The Institute for 21st Century Energy, the energy policy arm of the U.S. Chamber of Commerce, said the goal of “Shale Works for US” was to make sure that lawmakers “don’t squander or obstruct this opportunity” and to “ensure no hindrance or regulatory barriers” to natural gas drilling. As reported in The Patriot-News of Harrisburg, the Chamber’s employment claims exceeded those reported by the Pennsylvania Department of Labor and Industry, whose Secretary shared the stage with Harbert that day. In its release, the Chamber stated that shale gas production “created over 300,000 new jobs in the last two years,” while the most recent Department of Labor and Industry data at the time indicated that, between the 4th quarter of 2008 and 4th quarter 2011, the industry created a total of 18,007 jobs in “core” Marcellus industries, with an additional 5,611 jobs added in “ancillary” industries. Based on the questioning it received at and after the July 19, 2012, press conference, the U.S. Chamber itself issued a revised press release that changed the 300,000 jobs “created” to 180,000 jobs “supported” by natural gas. The U.S. Chamber did not explain the basis for (or the source of ) this revised claim. The press conference in Pennsylvania’s Capitol could have occurred in any state experiencing a shale boom. Industry officials make claims about the economic benefits of hydrofracking that are intended to impress — but overstate job growth, which remains small relative to overall state employment, and fail to mention the costs imposed by drilling on communities, local governments, and the environment. An accurate assessment of the short- and long-term impacts of shale development is necessary to adequately prepare drilling communities for the emergence of the industry, to estimate negative externalities associated with this industry (such as road damage, water treatment, and habitat loss), and to recover the costs of these externalities. That accurate assessment must include defensible estimates of the number of jobs created in the industry, the wages associated with those jobs, the distribution of those jobs between in-state and out-of-state workers, and the relationship to total state employment. 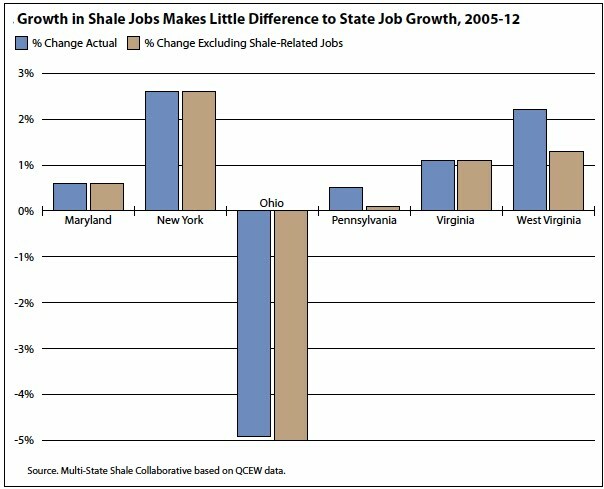 Between 2005 and 2012, less than four new shale-related jobs have been created for each new well. This figure stands in sharp contrast to the claims in some industry-financed studies, which have included estimates as high as 31 for the number of jobs created per well drilled. Some residents of shale drilling counties have, it should be acknowledged, benefited from the emergence of the industry, particularly during the depths of the recession. It is also true that Ohio, Pennsylvania, and West Virginia have long histories with coal and oil “resource curses,” which have provided wealth for a few but left a legacy of environmental degradation and poverty in their wake. The decline of shale employment in Pennsylvania in the 12 months ending in the 4th quarter of 2012 is a reminder that resource extraction has rarely proved a reliable route to sustainable regional prosperity. Policymakers in shale-rich regions should view employment projections with caution and recognize that even robust gains can be quickly reversed.